While working on my new design I've been getting loads of ideas for new designs. 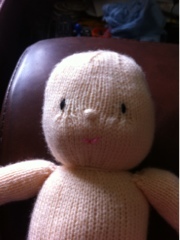 Just need to choose a hairstyle for this lass, And find me some hours in the day to do all this knitting! 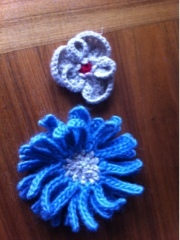 Two flower brooches made using patterns from '100 flowers to knit & crochet'. It's a really good book and the patterns are easy to follow. I got this copy from the library but think I may end up buying my own copy to keep. Quick and easy presents are always handy! 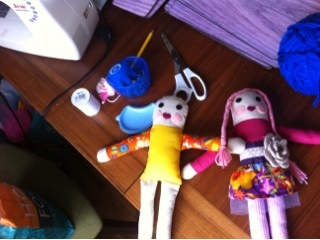 I spent today making two dolls as gifts for a joint-birthday party that Emily is attending tomorrow. All set and ready to go. Just need to wrap them now! Why a mouse of course!! A new pattern will be coming very soon ! 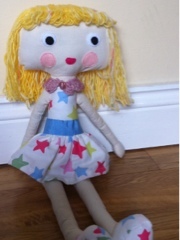 I have a custom order for 3 of my rag dolls to make at the moment. I hadn't made one since before Christmas so made a refresher doll to remind myself of any little quirks and tweek the pattern a bit. Think she turned out pretty well! 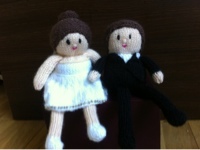 Just realised I never showed a picture of the wedding toppers that went to Brooklyn - they looked very dapper! And seeing them gave my sister the idea of getting wedding toppers as a present for her friend's wedding next week. Busy, busy, busy here! I made cap sleeves for the bride's dress as follow: Cast on 6 sts. Row 1:kfb,k to last st,kfb - 8 sts. Row 2: p Row 3: as for row 1 - 10 sts. Row 4: p Cast off. Sew in place over arm with cast off edge as lower edge of sleeve. or a girl with short hair - if that's what's needed! 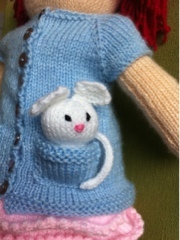 Use 3.5mm needles and double knitting yarn in the colour of your choice. Abbreviations as per the Petite Purls pattern. Row 20: (k2, k2tog) to end - 30 sts. Row 22: (k1, k2tog) to end - 20 sts. Row 24: (k2tog) to end -10 sts. Break off a long length of yarn, thread through the remaining stitches, pull up tightly and fasten off. Seam the row edges. Place the hair on the dolls head, pinning if desired to keep in place. Sew in position. Inspired by the boy from the books 'Lost and Found' and 'Up and Down' by Oliver Jeffers. Both are favourites with the kids! We're having our summer in Ireland at the moment. It's normally at this time as the secondary school children are stuck indoors doing their state exams!So we've been spending a lot of time outdoors, and not as much time crafting. My crafty endeavour today was to paint the garden shed - a lovely blue.